Still building and tweaking, but couldn’t wait any longer to get a feel for the new ride. Not enough time in the saddle yet to analyze and report back. For now I’ll just say a lot of grinning was going on. Now, that is a good-looking bike. If it rides as nicely as it looks, you have a difinite winner there! Ooh! Shiny! Tell us about the parts that are on it and the parts you're gonna put on it. You are a bad influence on me! 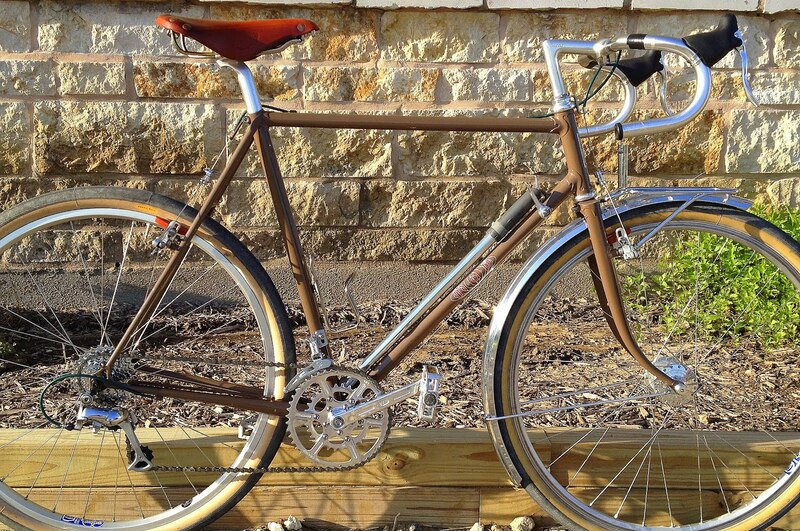 Your new bike looks to be both elegant and utilitarian; I'm pleased for you. Now, the details? Looks much nicer in this light. Beautiful frame, beautiful bend in that fork. So, what method do you use to get the labeling off the rear derailleur? I've been wanting to remove the "Ultegra" from my Ellis derailleur. Wasn't sure how to do it. Thanks all, for the encouragement.GravelDoc, still working through a few build details, but will elaborate in a future post.Doug, I used some kind polishing product, can't remember the name. I'll look it up and get back to you. Like you, I have a number of nice bikes including a dedicated randonneuring bike and a Hilsen (and an LHT and Cross Check). I recently parted with my Quickbeam and that's fine. While I'd like to trim down the quiver even further due to overlap with my bikes, I can't bring myself to part with any of them yet. I've had the CC a long time. The LHT is the most utilitarian and handles loads best of the bunch, the Hilsen is a sentimental favorite and the rando bike is great but I'm having some issues with the parts on it. I would strongly caution you about parting with the Hilsen. Like you, my Hilsen has recently been canabalized to get my CC on the road and for a brief second I thought about parting with it but just can't do it. It's a beautiful bike that has served me well. Since I've got so many bikes I've thought of setting the Hilsen up with Albatross bars as a townie/dirt road rambler. I think if you parted with the Hilsen you might regret it. That MAP is a beautiful bike. Happy for you that it came your way. Jan Heine gushed about the MAP bikes in BQ so you clearly have a winner of a bike on your hands. Looking forward to seeing where it takes you.–Leaf S.
Leaf, alas, the AHH frame/fork was sold. I took the parts off, stared at its bareness, like the day it arrived, and was flooded with flashbacks. Bittersweet moment. Simplicity is not easy. "Simplicity is not easy." No, it's not, but does seem to be worth it. I can't help but wonder if you just made room for another bike. ; )The MAP is beautiful. I live in Portland so I've seen a few around town. A friend is about to take delivery of one in May/June and is very excited.–Leaf S.
Nice! That crankset looks awesome!